Hi guys, David from Czech Rep. here. Hm, I am really interested whether I am able to build something with little more quality than my childhood creations. But I am...scared. Hell, if I won't start now, I will not ever. So, here I am. The ships I always liked the most, were the post-Pearl Harbor upgraded/rebuilt US Navy battleships, mainly Tennessee, California and West Virginia. 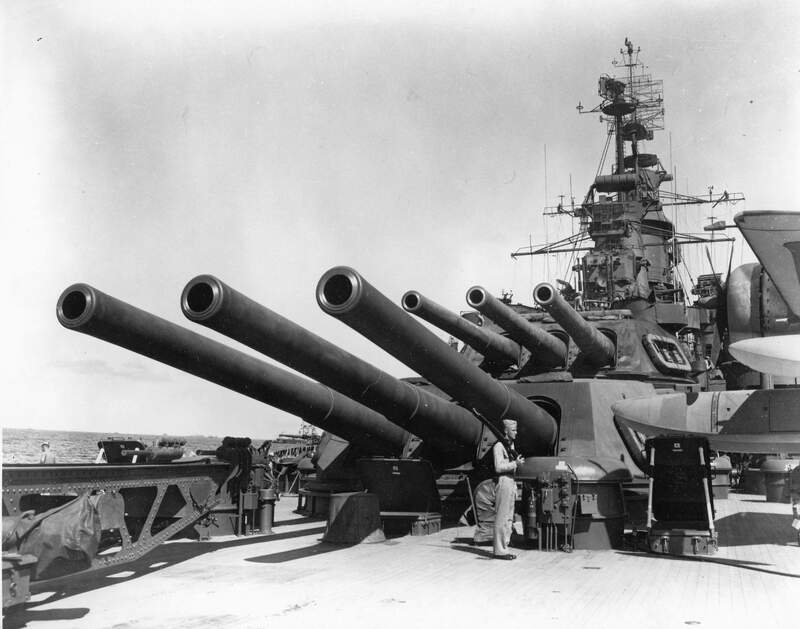 The iconic image of USS Tennesse bombarding Okinawa, the compact pyramidal structure bristling with huge amount of guns, platforms, radars and antennas...just BADASS. Hey, Trumpeter released 1/700 USS Tennessee, 1944! Awesome, I will have my own "Rebel Ship"! So I started with the "Big T". It went really good but after some time I deliberately decided to stop the work and to mothball the current progress. The main reason was the daunting MEAS32 camouflage scheme. I just didn't want to screw my favourite battleship until I get used to some modelling techniques. In the meantime, I bought USS California (1945) and USS West Virginia (1944). But I didn't started with either of them. WeeVee was out of the question because of the MEAS32. USS California was the hot candidate but in the meantime I decided - if I am supposed to get used to more than basic stuff, I have to go big time. Photo etching, metal barrels, trying wooden decks and so on. And since no 1/700 14''/50 metal barrels are available yet, I had to start with the kit that has all the mentioned. This brought me to the rest of the Colorado class. And since USS Colorado is again in the MEAS32, here we go. Hello, my name is USS Maryland, status as after the summer 1945 refit. You probably have read all the reviews of the kit, it is not my intention to go through all the details. Just the main findings. The kit is very nice in my opinion. The main deficiencies are too wide anti-torpedo blisters and not particularly well shaped front sides of the 5'' turrets. But I decided to live with these. Minor deficiencies are related to the radar equipment. The kit has the Mark 3 fire control radar on the top of the front mast and the Mark 8 FCR on the top of the aft superstructure (instead of the newly installed Mark 13). But as I plan to replace the plastic radars by the WEM photo etched, it is of no concern. Final little mistakes are related to 40mm Bofors guns. They are all shielded in the kit but according to photos, only the bow installation actually was. Moreover, two 4x40mm sets are supposed to be installed on the forward superstructure. In the reality, 2x40mm should be there. Again, the photo etched AA weaponry will be used, no concern about this. - Dry fitting of the main modules was completed. Virtually nothing is glued together (especially the front superstructure) just for the purpose of painting. Small components as searchlights, hovering platforms, ladders etc. are not yet present, they will be installed after the painting. - I decided to replace the already installed brass 16''/45 guns by the variant without blastbags. Double work but who cares. I like them more. Last edited by Daytona675R on Fri Dec 09, 2016 10:16 am, edited 5 times in total. Looking good so far and I am looking forward to your progress. Take a look at some of these: http://www.3dmodelparts.com/ You may find some guns that look better than PE. The already installed Master 16''/45 barrels were replaced for the "without-blastbags" variant and I started to switch the original plastic 5''/38s by the Master ones. In fact, I didn't expect any significant improvement...but I think the difference will be noticeable and worth the effort. The WEM USN WWII Radar Set finally arrived so once the 5''s are finished, the radars replacement is next. Nice work! She's got brutish good looks. Thanks guys, really appreciate it. Well, the results can only be better Never mind, it is certainly fun. Those brass barrels look much better than the plastic ones. Looking forward to more progress. Not very much of a progress right now. However, at least I installed the TDY-1 jammer in front of the foremast fighting top. Moreover, I decided to throw away all the allready completed Bofors mounts in a trash can. I found the barrels simply too thick as I constructed them according to the instructions provided (two layers were supposed to be glued together to obtain one barrel). This resulted in barrels thick almost as those brass 5''. I tried to create one mount with just one-layer barrels and the result is much better...at least I think so. Very nice looking build and for the camo measures I would recommend getting some from Gator mask plus a roll of Tamiya tape to hold and position some of the cut-outs. I used one for USS Calif. 1944 and it was AWESOME! I am ordering one for my Wee Vee this week directly from Gator if Free Time doesn't have it in stock. Keep up the Great work and pics. Last edited by Daytona675R on Fri Mar 25, 2016 11:53 am, edited 1 time in total. Wrong, all wrong...I didn't realize the Mk12s installed on the Maryland were without the vertical side-bars. So, removal and correction. The problem with the not properly shaped mounts persists but I will let it go for now. Switching the already installed SK radar for the WEM variant is next. Finally some progress after a long pause. The full complement of the Bofors guns has been finished in a one-layer barrel version. An improvement over the previously completed ones that ended in a trash can. Unfortunately, the 1/700 Eduard set (#99037) is still just a little bit oversized. For the next ships I am probably looking for something else. I will continue with the SK radar now. She looks great, glad to see some more progress on this. 1/700 scale rebuild of diorama project 960 square feet. - The Bofors guns - why couldn't I build just one sample of the single-layer and double-layer barrels just to compare and choose the better one? No, Mr Smarty had to complete all eleven quads...and only then realize that the barrels are simply too thick. All to the trash can. Born stupid? Try again. Anyway, the already installed (how surprisingly ) plain variant of the SK radar was replaced by the 3D WEM's version. As such, the radar work is almost finished except the one on the top of the aft mainmast. However, I am in trouble as I still wasn't able to recognize whether it should be the SM or SP. Btw, I'm considering to replace the aft mainmast yardarms for something more subtle. All the work with small details as railings, antennas, deck stuff, ladders etc. comes after that. 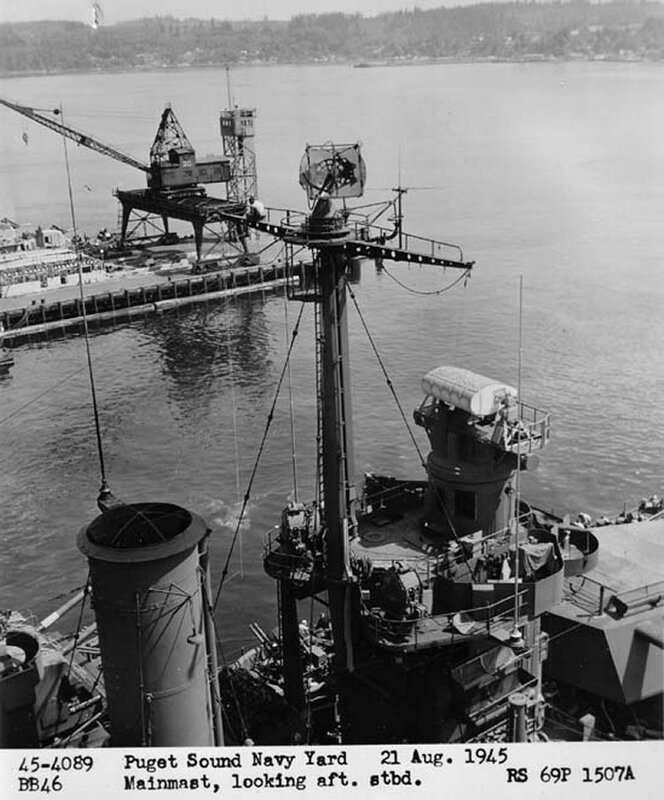 I found out the unrecognized main mast radar is the same that was present on the USS California (http://navsource.org/archives/01/061/014402b.jpg). And it is decribed as the SP. Unfortunately, I don't own this particular version so I have installed the one I had (used on Iowas etc.). As such, I am aware it is not completely accurate but this is the best I could do. I considered the radar work finished but I somehow forgot about the Mark 8 FCR dipoles. Onto them now! The Mark 8 FCR dipoles by WEM are actually looking well so I decided to install them. The radars are finished. Quite a long period without a report. My intention was to paint what was already made so I could continue with all the details then. However, when I tried to mix the 20-B Deck Blue according to the Tamiya's formula "XF8 Flat Blue (3) + XF24 Dark Grey (4) + XF7 Flat Red (1) + XF2 Flat White (6)", the result was something rather suspicious. I did not have any reliable reference but I intuitively felt the resulting color is too light and too "blue". I decided to suspend the painting (and as such, all the work) and ordered paint chips from Snyder&Short's (shipcamouflage.com) to have a reference in hand. As it takes some time to process it around a half of the world, no progress was done (in the meantime, I decided to start another project, the USS Washington, but nothing interesting was done so far, hence no report yet). As the paint chips arrived, I'm re-starting the work. By the way, the suspicion was confirmed, the resulting color of the above mentioned formula is quite nicely matching the Flight Deck Stain 21...but does not resemble the 20-B Deck Blue even close. I ordered the Sovereign Hobbies Colourcoats but I'll try to mix the appropriate 20-B by myself as well. Quite ironically, only several days ago I realized, that the Tom's Modelworks #775 sets ("Cage mast details") that I originally ordered for the next planned builds (1941 California and WeeVee) did not contain only the parts for 1941 fits of the Big-Five but for upgrading the masts of the late-war Maryland and Colorado as well. So...I did not have to wait, I did not have to start the Washington... It's rather ridiculous. Never mind. Both masts were upgraded. The yardarms are actually a little wide but I'll decided to live with this, the result is definitely an improvement over the OOB look. The foremast is missing the supporting braces for the fighting top yet, they are planned next. Please, ignore the blue surfaces, those are just results of the above desribed Deck Blue mixing experiment. In the meantime, I also started the replacement of the already installed (yes, the same old song ) 5''/38 turrets for the 3DModelParts version. They are looking much better than the original Trumpeter's ones.